With its ultra-wide-angle lens, D-Link's HD 180-degree camera can take in more of a room from a fixed position than other cameras. Most home security cameras are adequate to monitor a single room, but that doesn’t mean they see the whole room. In all but the smallest spaces, there will be blind spots. Cameras with sound detection mitigate this by alerting you to action happening off camera, while those with mechanical pan-and-tilt let you look at different areas of the room by changing the camera’s viewing positing on the fly. D-Link’s HD 180-Degree Wi-Fi Camera (model DCS-8200LH) takes a different approach: It uses an ultra-wide-angle lens to take in all the scenery at once so you never have to wonder if you’re missing something. It can also be used together with other mydlink connected home products. For example, if your D-Link Wi-Fi Water Sensor detects a leak, you can take a peak at what’s going on through the camera’s feed. If you’re used to the spheroid motif of most Dropcam-style security cameras, you may be taken aback by the DCS-8200LH’s design. Instead of being housed in a tennis-ball style enclosure, the camera and its pair of infrared LEDs are mounted to a smartphone-size rectangular body. The whole unit screws into a stand for tabletop placement, or alternatively can be affixed to a wall or ceiling with the provided screws. The DCS-8200LH’s ultra-wide-angle lens allows it to take in even large rooms without changing position. The DCS-8200LH’s unique design is presumably to give its 180-degree lens an unobstructed field of view. Indeed, it allows you to take in a wide swath of your home or business landscape without having to change the camera’s position or use multiple cameras. De-warping technology is also built in to counter the fisheye distortion that’s a troublesome byproduct of wide-angle lenses. The camera supports both sound and motion detection with responsive recording—any noise or movement will trigger a video to be recorded in up to 720p resolution and you’ll get a push notification alert. You can also use IFTTT to pair the camera with other manufacturers’ smart devices to trigger additional actions when an event is detected. For example, you can have your Philips Hue lights automatically turn on when a loud noise is detected, or have the camera start recording video when your Ring doorbell is rung. 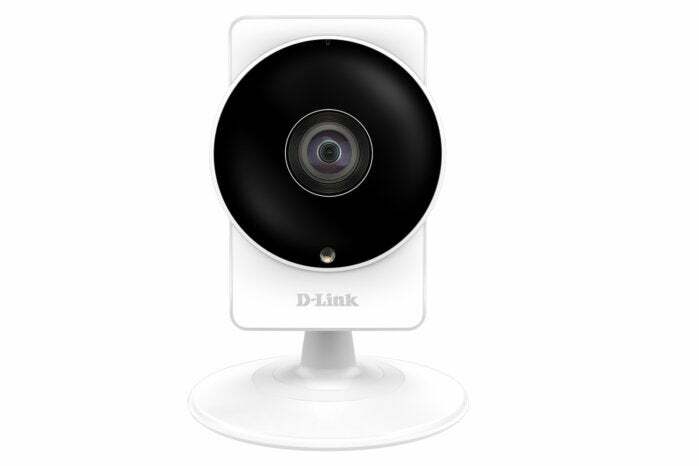 Like other D-Link home security cameras, the DCS-8200LH does not support cloud recording. All video footage is recorded locally to MicroSD/SDXC (up to 128GB, card not included). This saves you the cost of a monthly or annual cloud subscription, but also leaves your surveillance footage vulnerable should an intruder take the camera or destroy the memory card. The DCS-8200LH doesn't follow the typical Dropcam-style design cues. 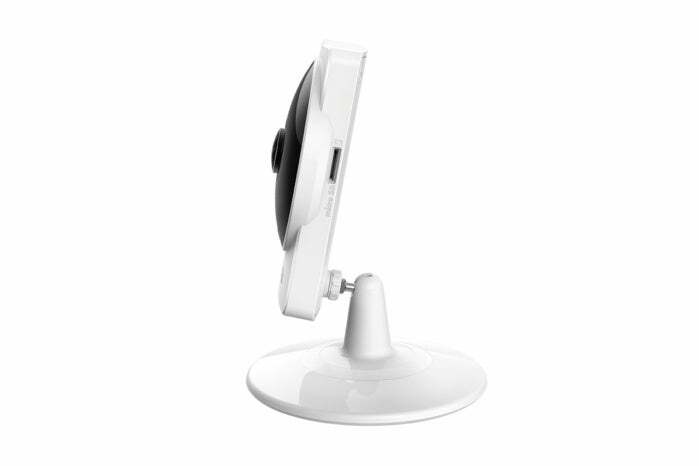 The DCS-8200LH requires a bit of assembly—mainly mounting the camera body to its stand—before you can use it. Once that’s done, you need to download the mydlink Home app, which will guide you through the process of connecting the camera to your Wi-Fi Network. The app itself is well designed and it’s easy to find your way around. Beneath the image of the live camera feed are buttons for (from left to right) turning the audio on and off, snapping a screenshot of your feed, toggling between 360p and 720p resolution, accessing video clips, and setting the camera’s night vision (off, on, or auto). The app works in portrait and landscape mode, though the latter is recommended to maximize that wide-angle view. You can set motion detection areas to monitor only certain parts of a room. Image quality is excellent in both day and night modes, with crisp details even when using the 8x digital zoom. The de-warping works well, too; only objects at the nearest periphery of the lens showed any image bending and it was very slight. Audio was also great, with no distortion or extraneous noise, though it’s a bit of a disappointment that it’s only one-way. Most cameras include a built-in mic for two-way communication—you can talk to kids or pets at home or scare off intruders—so this is a puzzling omission. Motion detection always carries the risk that you’ll be inundated with alerts when the camera mistakes incidental movement, such as a fluttering curtain or an errant pet, for a security breach. That’s especially significant with a camera that covers as much ground as this one does. Fortunately, the mydlink Home app offers several ways to customize motion detection to reduce false alarms. First, you can set motion detection areas—you just tap squares on a grid over the area you want to monitor. This is helpful if you just want keep an eye on a door or window, or exclude the area where your dog is restricted when you’re away. You can also adjust the motion sensors sensitivity with a slider that ranges from “low” to “high,” though this takes some experimentation to calibrate. Lastly, you can turn off motion detection completely when you’re home if you don’t want to unplug the camera. Though sound doesn’t typically pose the same false alarm issues unless your home has a lot of ambient noise, you can adjust the sound detection settings as well. For this you have to turn the Noise Level feature on, then you can set a threshold of 70 dB to 90 dB. Other than its 180-degree lens, there’s really nothing remarkable about the DCS-8200LH. But that’s not necessarily a bad thing. All the standard security features are here, and if you’re looking for a camera that “just works,” this one fits the bill. Its generous field of view allows you to place it without having to fuss with various angles, and the mydlink Home app can be mastered in mere minutes. The IFTTT support is attractive if you’re already using a lot of other smart home appliances. The lack of cloud backup is always a concern in our view—how else to ensure the security of your security footage?—but if you can live without it, the DCS-8200LH is a simple solution you can rely on. The D-Link DCS-8200LH HD Pan & Tilt Wi-Fi Camera is a fantastic option for monitoring large spaces or tracking active kids and pets.